Tollington Way – 1 large Double room, part of a three bedroom town house in a gated development just off Holloway Road. The property well served by public transport its only 30 minutes away on a bus ride from Soho or Trafalgar square. Tube station such as Archway and Holloway can be reached in 10 minute by bus, where Upper Holloway overground station is only 8 minute walk away. The nearby area offers all sort of facilities ranging from Supermarkets restaurants, convenience stores, cinemas, cafes and more. You will share with the Landlady, who is a former teacher and a professional Italian young man. Been very close to the centre this room would be well suited for a university student or a professional, working in central London. THE ROOM is a rather large room with a double bed, a side bed table, a chest of drawers, a double wardrobe, chair and a books shelf. 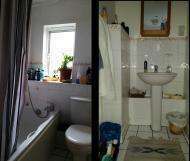 The town house has a lounge a kitchen and one bathroom which you share with the other tenant and the landlady. This opportunity will suit individuals who like warm friendly household environments where each sharer in time becomes a bit more than a paying guest. Please note that we are looking for tenants who can commit for a minimum term of six month. you\'ll be offered to sign a fix term share agreement, subject to reference checks and to our fees which will be happy to discuss with applicants in due course. Thanking you for taking an interest in our ad. We look forward to be able to show you this sensibly priced house share opportunity.